On Saturday evening, March 11, my wife and I attended a concert billed as "A Celtic Appalachian Celebration" at Symphony Space on the Upper West Side. It was sponsored by the Irish Arts Center and featured Mick Moloney (photo) as master of ceremonies, as well as being one of the musicians. Mick has been the recipient of a National Heritage Award from the National Endowment for the Arts and a Presidential Distinguished Service Award from the President of Ireland. I had the pleasure of meeting Mick, and hearing him play and sing, at the Brooklyn Historical Society several years ago. 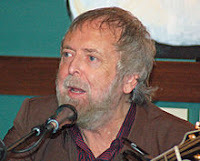 The headline act for the event was Green Fields of America, a group, named for a song, that Mick Moloney formed in 1978 "to present and tour some of Irish America's finest musicians and dancers" (Wikipedia). Over the years, the membership of the group has changed. The clip above shows them playing an unidentified, very spirited Irish tune. The group at the time this video was made included at least three musicians that were part of the group that played on Saturday: Mick Moloney on guitar; Athena Tergis on fiddle, whose background includes being in the cast of Riverdance and touring with the late Clarence Clemons; and Billy McComiskey on accordion. Others who were with the group on Saturday were: Brendan Dolan on piano; Brian Fleming on drums; Liz Hanley on fiddle and vocals; Jerry O'Sullivan on pipes and whistle; and the immensely talented fourteen year old Haley Richardson on fiddle. As mentioned above, Mick intended to showcase Irish American dance along with music. The clip above shows two members of City Stompers, Nicole Ball and Sara Rowbottom, dancing to the music of the Melody Allegra Band. The first minute and thirty seconds of the clip is all music, then the dancers take the floor. The City Stompers, led by their director and choreographer Megan Downes, took the floor often during Friday's concert. Their style is "Appalachian Flatfoot," which is characteristic of the Ulster Scots, or "Scotch Irish," who settled Appalachia during the late eighteenth century. They were descendants of the Protestant Scots who were "planted" in northern Ireland by James I during the late sixteenth and early seventeenth centuries in an effort to subdue the Catholic Irish. As Mick Moloney noted, the term "Hillbilly" comes from the popularity of the name William among the Presbyterian Scotch Irish. Two other dancers, who doubled as musicians, also appeared on stage, sometimes with the women of City Stompers and sometimes by themselves. Jake James is a dancer and multi-instrumentalist who has performed with many groups, including one of my favorites, Black 47. Niall O'Leary is a polymath: dancer, musician, businessman, and architect. Anna and Elizabeth are Anna Roberts-Gevalt (at right in the clip above) and Elizabeth LaPrelle. Elizabeth is a Virginia native who grew up in the Southern Appalachian musical tradition, of which "Little Black Train," the song they do in the video, is exemplary. Anna grew up in Vermont, which is also part of Appalachia. (Geologists will tell you it goes all the way to Maine and southern Canada.) During the concert, Anna and Elizabeth performed a couple of songs that Anna learned from older singers in Vermont, thus giving us a taste of a lesser known Northern Appalachian tradition. Another taste of the southern Appalachian tradition was provided by the wife and husband duo Erynn Marshall and Carl Jones. "Tune Tramp," which they do in the clip above, was one of the songs they performed at the concert. They also did "Decatur Stomp," a tune Erynn composed that combines the old time Appalachian and Ragtime styles. You can hear it here. The concert ended with all the musicians and dancers on stage doing a stirring medley of Irish and Appalachian music and dance. It was a fine warm up for the feast of St. Patrick. Another remembrance I missed: Mose Allison (1927-2016). 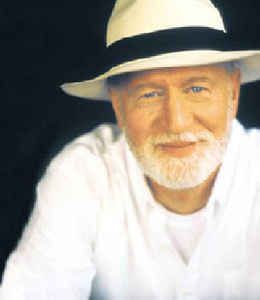 I first heard of Mose Allison during my college years. I had a copy of Johnny Rivers' album Meanwhile Back at the Whiskey à Go Go, which led off with the Willie Dixon song "Seventh Son," which I loved. I later heard a version by Mose that I liked even better. For a time, I assumed he had written the song. I was thereby led to seek more by him, and acquired some albums, which gave me a sense of the breadth of his talent. It encompassed jazz, blues, and R&B. Not bad for a self described "middle class white boy" from Mississippi. At the end of the show, my friends were all fans.